Having a peeler handy can really help out with food preparation. 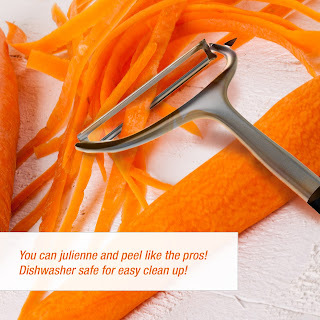 If you have children helping out this kind of peeler is much easier to use then a paring knife. I think all of my children started with a peeler just like this, minus the sharp spike which is great to use to crack eggs open by the way. I usually just crack my eggs in one hand while baking, but my children are still learning and this helps them out greatly in cracking eggs. Love that this is easy to clean and store. We keep our peelers right in our utensil turntable on the counter for easy access. You can purchase the SIWU Vegetable and Fruit peeler on Amazon. What SIWU has to say abou their product. Unlike other peelers, the ultra sharp stainless steel cutting blade is mounted in metal (not plastic) for long-lasting durability. Nonslip black plastic ribbing on the top of handle gives you a firm grip for professional-style peeling. The blade is positioned perpendicular to the handle to make the most efficient slicing motion. So you can julienne and peel like the pros! It's super easy to cut eyes out of a potato with the handy micro triangular knife point on the side of the peeler. You can also use it to knick the rinds of oranges, lemons, and other citrus fruits for easy peeling. 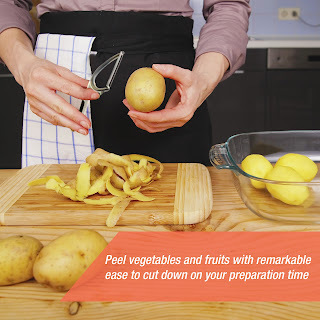 Peel vegetables and fruits with remarkable ease to cut down on your preparation time so you can focus on creating fabulous, tasty, healthy meals. Dishwasher safe for easy clean up. Disclosure: MarksvilleandMe received one or more of the products mentioned above as part of a promotion with Tomoson and SIWU. Regardless, MarksvilleandMe only recommends products or services we use personally and believe will be good for our readers. Some of the links in the article may be “affiliate links.” This means if you click on the link and purchase the item, I will receive compensation. If you would like MarksvilleandMe to review a product or service please contact us at marksvilleandme@gmail.com.